The main focus of this book is on different topics in probability theory, partial differential equations and kinetic theory, presenting some of the latest developments in these fields. 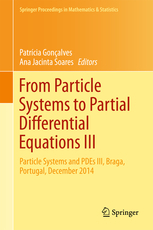 It addresses mathematical problems concerning applications in physics, engineering, chemistry and biology that were presented at the Third International Conference on Particle Systems and Partial Differential Equations, held at the University of Minho, Braga, Portugal in December 2014. The purpose of the conference was to bring together prominent researchers working in the fields of particle systems and partial differential equations, providing a venue for them to present their latest findings and discuss their areas of expertise. Further, it was intended to introduce a vast and varied public, including young researchers, to the subject of interacting particle systems, its underlying motivation, and its relation to partial differential equations. This book will appeal to probabilists, analysts and those mathematicians whose work involves topics in mathematical physics, stochastic processes and differential equations in general, as well as those physicists whose work centers on statistical mechanics and kinetic theory.